The weather has been very nice the past few days; sunny and around zero to start the day and in the thirties by afternoon. We might even refer to it as short sleeve weather. The cold weather testing season will soon be over and a few of the Bosch Boys took advantage of the weather to skate and play a little hockey on the outdoor rink on the bay. A little exercise over the lunch hour is a welcome relief with the long days they put in. 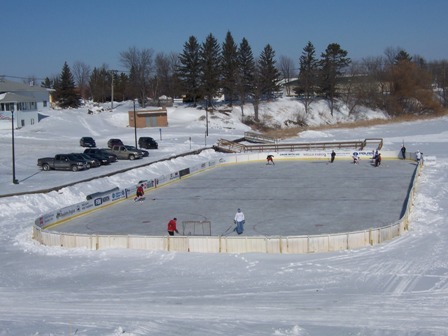 They skate at the arena when they are in town and enjoyed the chance to skate on natural ice. I hadn’t fished in two weeks and felt like spending a little time outside so I took the snowmobile and went up river and fished outside for a hour or so before dark. 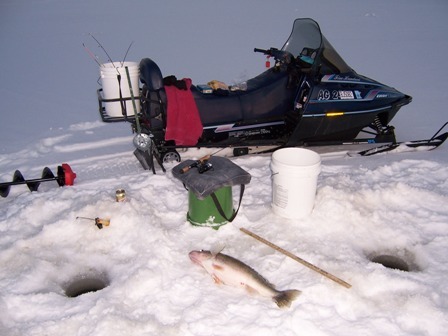 I caught a small sauger and three walleyes; two nice eaters and one 28″; she was a dandy. She filled the 8″ hole, both coming up and going back in after a picture. Most reports from the river are one; maybe none. I’ve heard of some good reports up across the lake, but not much going on this side.